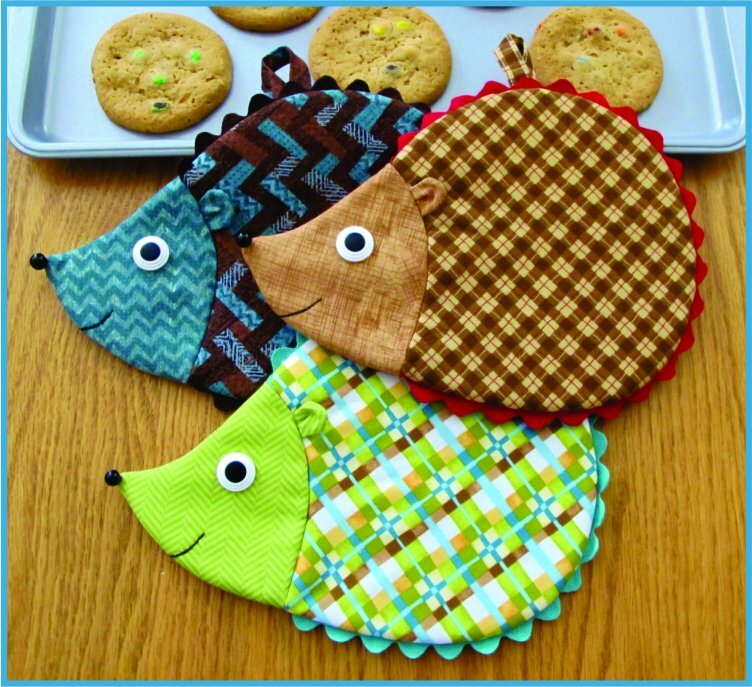 Pattern pieces and instructions to sew up some sweet Hedgehog Pot Holders or Mug Mats! Sew easy, so quick, fun and functional! Approximate finished size 7" x 9". IMPORTANT TIPS: Do not be misled: the Head for this pattern DOES fit the body, in spite of the appearance of the pattern page. The problem is that when you open the pattern, the Head and Body pieces are right next to each other and they donâ€™t look like they will fit - BUT THEY DO! Itâ€™s like sewing in a sleeve or any other curved piece. Cut out your pieces as noted on the pattern and prepare the Hedgehog following the instructions. Once you get to the point where your ready to attach the Head to the Body, with RST, pin the end of the Head and the Body together; now continue to pin the pieces together like a sleeve...they fit RIGHT? Now sew them together. If they don't fit, then check your cut pieces next to the templates and be sure youâ€™re not working with any of the batting yet. The second item is that you do not cut a Back Body piece because there isnâ€™t one - you donâ€™t need one. This approach could be something new to you, but itâ€™s not to Susieâ€™s designs, because Susie is a little lazy - she likes to take short cuts whenever possible. Once you piece your Ears, Head and Body, you build a stack as instructed in instruction #8 using the remaining Hedgehog Body fabric and batting(s). Youâ€™re using your pieced top Hedgehog as your template and you just sew around it as instructed. This process saves time piecing and cutting - you donâ€™t need to cut, piece and sew two Hedgehogs nor do you need to fussy-cut the batting(s), and with the edges on the stack you wonâ€™t stretch out the basic shape of the Hedgehog...Easy Peasy!